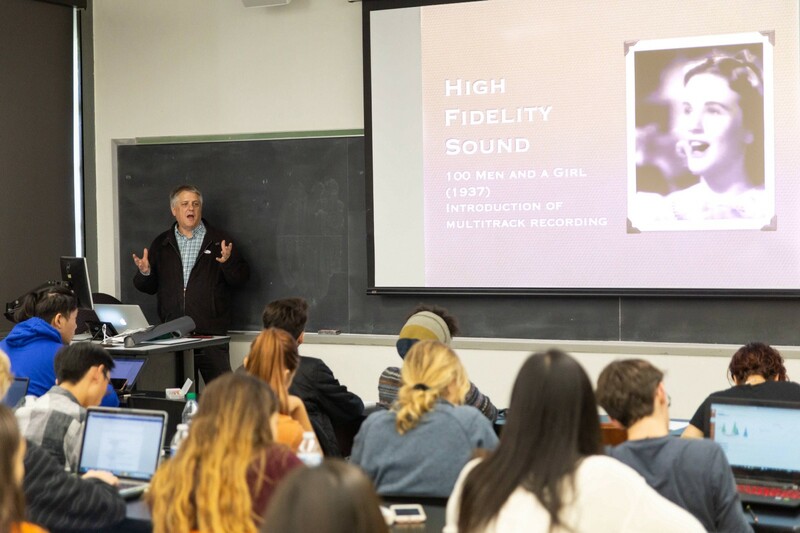 Professor James Buhler’s undergraduate course, Introduction to Music and Film Sound, is a feature article on Medium.com. The course is part of the UT Skills and Experience Flags program which provides undergraduate students with focused study in: Cultural Diversity, Ethics, Global Cultures, Independent Inquiry, Quantitative Reasoning, and Writing. Writing can be a daunting task for even the most intrepid and experienced author. For first-year college students, writing a college research paper can feel like being thrown into the deep end. At the University of Texas, Music Professor Jim Buhler teaches first-year students how to wade step-by-step into the waters of academic writing and navigate the process with confidence. When Professor Buhler talks about his Introduction to Music and Film Sound class, you can hear his passion for teaching the history and methods of using music in films. But, one of his main goals is to teach students how to do independent research, analysis and writing at the college level. Throughout the course, Professor Buhler guides the students through writing a critical research paper by giving them a structured writing process and discussion groups where they can explore their ideas and get feedback. Professor Buhler breaks down their final paper into several assignments to help the students focus on developing higher level writing and research skills. He teaches the students the best practices of writing a research paper, from deciding which film to write about, to finding sources, and writing scene analysis. Instead of assuming the students are familiar with scholarly articles, he shows them how to take a source, analyze it, and determine how it speaks to their paper. He hopes that the research methods and analytical tools he gives them can apply to research in other disciplines.